Have you been spinning your wheels trying to dial in a niche that you can make money? Running ads but not generating a positive ROI? Or see all of the incredible opportunities out there and don’t know which one to jump on? Competitive analysis will save you from running around in circles, banging your hands on the keyboard, while not making money or being frozen and not knowing what to do that will make you money. Whether your stuck or spinning, competition research is here to save the day. 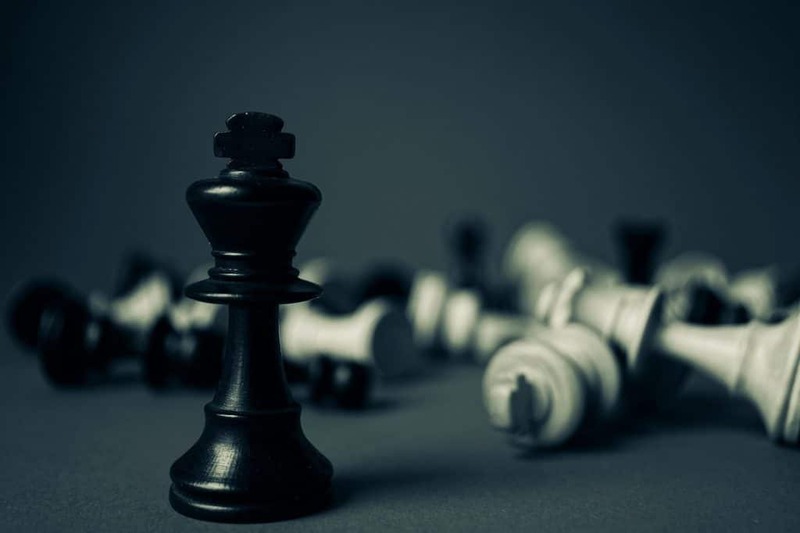 Not only does this investigative work help you to narrow in on the burning desire of your customers, but it reveals some key information to why your competitors are doing what they are doing and how you can beat their game. No need to reinvent any wheels here, you just need to be better than your competitors and you win! Very few in the game will do the work it requires to research competition so the little bit of effort that this takes will bring you a huge boost! There are 4 free places I will show you, where you can get a thorough view of the competitors in your niche. When you do this research you are doing what 99% of business owners and marketers will not do. Let’s get you ahead in the game!!! The first thing to know about competition research is you WANT to find competition. You don’t want to be the only one in your niche, as appealing as it sounds to tap into an untapped niche. There’s no money in that niche that’s why no one’s in it. No one has ever thought about that niche before you. You might think, awesome, I have an idea that no one has ever thought about before. First in line, yeah!!! You want to be in a niche that has revenue opportunity in it, something that people are actually pouring their time, money and energy into because of the returns on their investment. And it’s not the time for you to run away and go to the most unsaturated niche on the face of the internet because market saturation is a myth! There’s tons of opportunity for you to carve your own way and get a chunk of the action. There’s plenty of room on Facebook advertising and becoming an authority with a smart content marketing strategy. But you need to roll up your sleeves, don’t just fall into the work smarter trap but also work hard and use your competitors’ success to your advantage. That’s what competition research is all about. What you’re looking for is a niche idea that has a precedent, a niche that shows very clearly that there’s money to be made in it. Working smart means you’re going to look at how your competitors are successful and leverage what they’re doing to earn money online. Always, ALWAYS look at the glass half full. Don’t let the false notion of having a ton of competitors in a niche stop you from diving deep. You have your own unfair advantage for business success but there’s always learning curves with any online business. One of those curves is outside of you and focuses on your competition. But by knowing how to do the competition research you’re able to narrow down on what kinds of products to sell and what pinpoint your audience wants. Here are 4 free and easy places to research your competition. I made this video for you to watch over my shoulder as I go through each platform. When you’re doing competition research start by taking niche keywords and searching for it on Google. Is anybody paying money to show their product, service, or brand when people search that query? It can be for a digital book, physical product, or a service. Sometimes you will even find promoted products that wrap the whole entire page. Advertisements being shown on the side of the organic search results as well as the top. What to learn by analyzing these Google Ads? If there are not any ads. Stay away! When you find search queries that populate tons of ads, you have hit a money maker. Click through the ad, view their landing page, optin to their free offer and go through their funnel, even buy the products! When you see a lot of ads generated you know that you’re getting close to the money. Play around your keywords and search relevant keywords that show up. If you’re in the golf niche search phrases like golf grip, golf swing, golf drivers, etc. Google AdWords are not cheap clicks. Go deep here, this is what your competition is spending good money on to sell their products and services. Google trends is invaluable for market research. It’s pretty incredible that Google provides this tool for anyone to use for free! You can use Google Trends to compare the search volume results of your niche ideas, products, services, of any search query. You can look at search volume data from Google back to 2004! 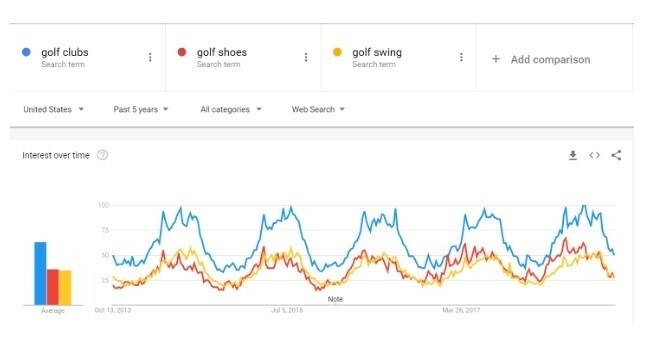 Here’s the data for the last 5 years of search volume of golf clubs, golf shoes, and golf swing. This niche isn’t a trend that is going away anytime soon. Solid, consistent, and predictable income when you see something like this. Or you can zoom in and see the most recent weeks, months, or years, depending on the filters you set. I wrote a whole tutorial on this tool, it is really powerful and you can go deep with it in How To Use Google Trends For Market Research. Now that you’re pretty clear on the niche you want to focus on, there’s one important thing to think about at this point…. What are you going to offer your target audience??! 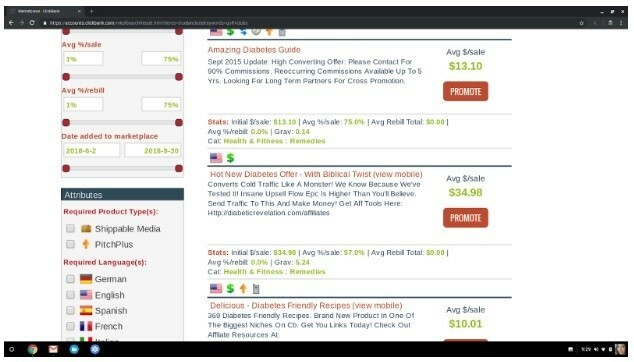 In the cure type II diabetes naturally niche, you could sell everything from meal plans for diabetics, exercise and diet to naturally cure diabetes, supplements, eBooks, DVDs, and membership programs. Udemy is an online learning center that allows you to take courses and become qualified in a particular field from yoga to SEO. You can earn a certification in almost anything. You can also use Udemy as part of your competition research before you build any online courses, membership funnels, or any information product. 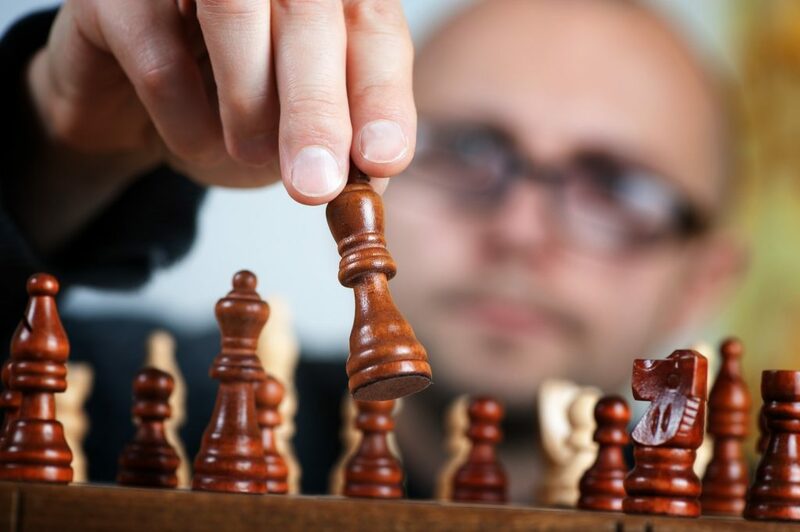 Here’s how to do a competitor analysis in this platform that can literally get you to create an outline for your course by getting inspiration from your competitors! If you search for diabetes in the search bar you can see how many people are actually offering courses in this niche. 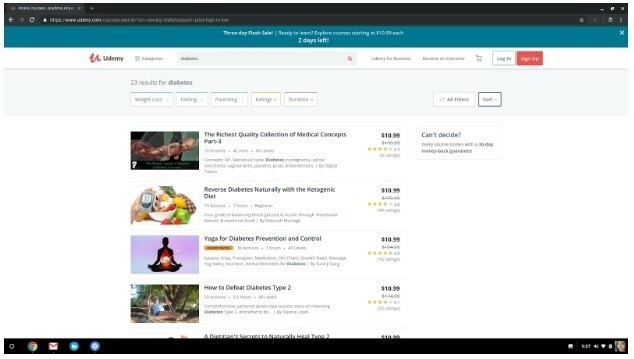 A natural diabetes course selling for $199, that’s impressive!! Scroll down and you’ll see there’s a good amount of people offering courses in this niche, which means there’s definitely money to be made here. Let’s take our competition research game another level and actually look at what your competitors are offering in their courses. That’s what’s awesome about Udemy, you can look around and study your competitors’ marketing material, their promises, and the actual thing people are learning from these courses to help inspire you to create your own. Of course, you’re not copying the exact same thing. There’s no reason to do that because the goal is for you to do you. You want to improve on the stuff your competitors are offering, make it a combo of competitor A, B, C, and D’s courses and your own. You can create a course that’s meatier, has more substance, and is more comprehensive than what your competitors are offering. That’s powerful information you’re getting and super valuable data you’ll want to look into when you design your courses and products. An outline for a course done by looking at courses that are selling on Udemy? Want to know what is moving and shaking in the affiliate marketing world? A free clickbank account will tell you what’s hot and what’s not. Clickbank is a crazy large and very popular affiliate network with TONS of products and TONS of affiliate marketers referring their traffic and audience to these products. So let’s find products based on diabetes cure and I’ll walk you through the process. I’m seeing 70 products in this niche, which looks pretty good. Looking inside of each product, you see “gravity”, Clickbanks internal algorithm that indicates the volume of sales and recency of the sales. The higher the gravity score, the more traffic being referred to that product and the more sales that are being made. You can sort by gravity and many other filters to research for free what products are selling, which ones are new, and what’s been sitting and not moving. Find a product similar to yours that is a mover? Analyze the sales pages, reverse engineer the emotions that the colors bring, the video message, the copy, the burning desire the message is conveying that the product solves. Turn your screen capture tool on and record everything as you Optin and buy those products! Reverse engineer their emails, thank you pages, one time upsells and everything else you experience. Don’t copy and plagiarize this info, but do use it as a starting place for your message. While you’re in here you might find that It is easier to just build a simple affiliate marketing funnel and make money fast without creating a product. What to do after you have analyzed your competition? There are two paths and 5 successful online business fundamentals to follow in order to crush your business. Learn and begin advertising on Facebook, design a custom sales funnel template and build a DIY Sales Funnel. You can crush it on either path with your competition research done. Congratulations on being one of the few to cross the T’s and dot the I’s in this research thing, you are starting many steps ahead and will soon leave the competition in the dust! Comment below and let me know your thoughts, insights, and if I can help out in any way!